For thousands of years the native Ch-ihl-kway-uhk people have lived within the Chilliwack River valley. The Nlaka’pamux First Nations have also indicated that their traditional territory lies within part of the drainage. Historic reports show that the entire Chilliwack River valley ‘was crisscrossed with Indian trails’ (Wilson, 1858). These trails led to hunting grounds, fishing areas, camps, quarry areas, berry patches, etc. There remain today several sites which are important to the Sto:lo (People of the River) for cultural, spiritual and economic reasons. Researchers have found 60 archaelogical sites within the watershed to date consisting of housepits, burial mounds, culturally modified trees, stone tools, lithic scatters and roasting pits. At least 12 settlement sites have been found in the area. Most of these lie between Vedder Crossing and Chilliwack Lake with major villages occurring at either end. The Whatcom Trail, which connected Bellingham (Washington State) with Chilliwack, was used by gold miners in 1858 during the Fraser Canyon Gold Rush. 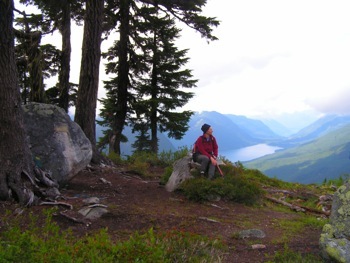 The trail crossed the border in the Columbia Valley and skirted Cultus Lake to connect to the Hudson Bay Company Brigade Trail which led to Fort Hope. The Hudson’s Bay Company constructed a trail extending to Chilliwack Lake in 1855. The Canada-USA border (following the 49th parallel) was surveyed in the 1850’s and the 1860’s by both American and the Royal Engineers surveying parties. These expeditions presented the first exploration conducted into some areas of the Skagit Range and resulted in the first maps and names used. In the early 1900’s a joint survey by Canada and the US made revisions to the boundary and replaced rock cairns with more permanent markers. The boundary was revisited in 1908 in order to verify each marker. Since then a swath of forest has been cut along the boundary to mark the Canada-US border. After the gold rush, people returned to settle in the Chilliwack area starting in 1862. 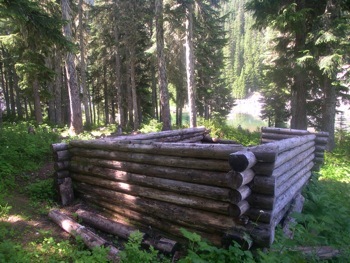 The trail was replaced by a wagon road to Chilliwack Lake in 1901 which led to a small rush for claims in the area (see Mining History section below). Popular stops along this road were McGuire’s ranch and the Thurston ranch (located near Slesse Creek). However, most settlement occurred here after WW II. Railroad logging began in the 1920s and has continued in different forms since then. Currently the City of Chilliwack, the Fraser Valley Regional District and the Soowahlie First Nations have jurisdiction over development within the Chilliwack River valley. The valley was slowly developed throughout the 1970s and 1980s in such locations as Slesse Park but growth has accelerated significantly since then throughout the lower reaches of the watershed. A recreational subdivision was created near Post Creek in 1969 but was never finished. 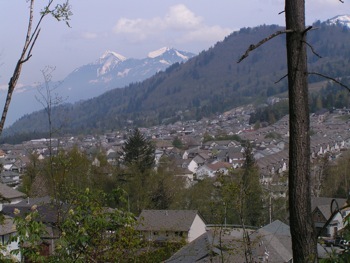 Approximately 2,000 people live within the Chilliwack River Valley which is considered to be fully developed to its capacity. On December 9, 1956 an E bound Trans-Canada Airline Flight 810 crashed into the upper reaches of Mt. Slesse. All 62 passengers and crew aboard were killed. To that date this was the worst aviation disaster in Canadian history. The four engine North Star aircraft (about the same size as a Dash 8) was completely wrecked. The wreckage was left on site and parts can still be seen today. A propeller cairn is located at the upper end of the Slesse Memorial Trail and a memorial is located lower down on the trail. Go to www.en.wikipedia.org/wiki/Trans-Canada_Air_Lines_Flight_810 for more info. There has been significant mining activity in this region in the past. By far, the most well known mining operation is the Lucky Four Mine located at elevations of ~1,650 – 1,920 m on the E slopes of Foley Peak. Showings were found here in 1915 by Prospectors from Hope – one main showing in the W and a lesser showing in the E (about 600 m to the SW of the main showing). The claims were optioned by A.S. Williamson of N. Vancouver. The claims were bought in 1917 by the contracting company Welch, Stewart and Foley. Diamond drilling began in the main showing with some of the holes being drilled through the glacier. Some open cutting and stripping was performed from 1917 – 1919. 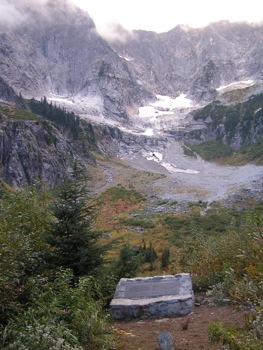 It is believed that during this period a well constructed trail was built from access roads below (connecting to Hope) for hauling equipment and supplies to Mile High Camp and the mine above, likely by horseback. A 50-60 m deep adit was driven. Work was then halted, likely due to poor findings. The property passed hands several times in the 1940’s. From 1950 – 1955, significant drilling was conducted (>1,200 m) and the adit was extended to a total length of ~165 m. Approximately 3,180 m of drilling from within the adit was also conducted. This work led to estimates of copper, gold, silver and molybdenum bearing ore which were never extracted. In 1956 a road was built to Foley Lake to allow access for further exploration of the area to the SE of the showings. In 1965, trenching was conducted and an adit was driven at the E showing. In 1967 the claims extended E to Foley Ck up the W slopes of Goetz Peak and Williams Peak and ~150 m of drilling was conducted (the remnants of these roads may be the tracks that are followed as part of the Goetz Peak MR). Reports indicate that 32 tonnes of select ore was flown out by helicopter from the main showing in the 1960’s. Some surface drilling was conducted in the main showing and the mine workings were mapped in 1971. The mineralogy of the rocks here is interesting. The main showing occurs at the contact of gneiss/schist (metamorphic) rock and quartzites/limestone/argillites/conglomerates which lies very near to a large mass of granodiorite. Garnets and possibly rare zoisite were found at the main showing. Also, a 6 m wide zone of huge quartz crystals was found here, with individual crystals measuring 10-35 cm in diameter and up to 1 m long. Currently, the mine workings are not safe to access and it is highly unlikely they ever will be. The main adit is located within very steep and unstable slopes and has collapsed. Do not attempt to access these workings – it is extremely risky to do so. Other mines existed such as the Lone Jack Mine in Washington State which was discovered in 1898. This gold and silver mine has been in operation on and off from 1901 to 1997. This mine was originally accessed via a trail up Slesse Creek in the Chilliwack valley. Another mine was the Boundary Red Mountain Mine which is located near to the Lone Jack Mine just S of the border. This gold and silver mine was discovered in 1897 and operated periodically from ~1907-1988. This mine was first accessed via the Chilliwack-Slesse Creek FSR but this access was terminated, mainly due to international complexities/limitations. There is no road access to this site from the S.
See other sections of this website for information regarding other historic mining related projects such as the marl mine at Cheam Lake and Mt. Pierce gold prospecting. Originally there were 4 minimum security prisons located along Chilliwack Lk Rd. Currently, there is only one prison operating which is the medium security Ford Mountain Correctional Centre. During WWII most of the Chilliwack Valley was designated for training. Currently, Canadian Forces Base ASU operates several training facilities such as a field training site near Chilliwack-Liumchen Ck FSR (now gated at both ends), and demolition training site near Chilliwack-Slesse Ck FSR (now gated). Several other DND lands exist within the Chilliwack area – many of these are currently not in use (see both maps for locations). Inactive and Abandoned Mine Lands – Boundary Red Mountain Mine, Mt. Baker Mining District, Whatcom County, Washington, by F.E. Wolff, M.I. Brookshier and D.K. Norman., Washington Division of Geology & Earth Resources, Information Circular 99, Revised January 2008. Inactive and Abandoned Mine Lands – Lone Jack Mine, Mt. Baker Mining District, Whatcom County, Washington, by F.E. Wolff, D.T. McKay, Jr., M.I. Brookshier and D.K. Norman., Washington Division of Geology & Earth Resources, Information Circular 98, March 2005. Cascade Alpine Guide, Climbing & High Routes, No. 3: Rainy Pass to Fraser River, 3rd Edition, Fred Beckey. Geography, geology and history sections, pgs 8-22, 2008.